Following record years for increasing ocean temperatures worldwide, Howe Sound is showing signs its waters are also warming. Warming can mean major change and lack of data specific to Howe Sound causes local uncertainty. Reviewer: Peter Chandler, Fisheries & Oceans Canada, Institute of Ocean Sciences, Sidney, B.C. 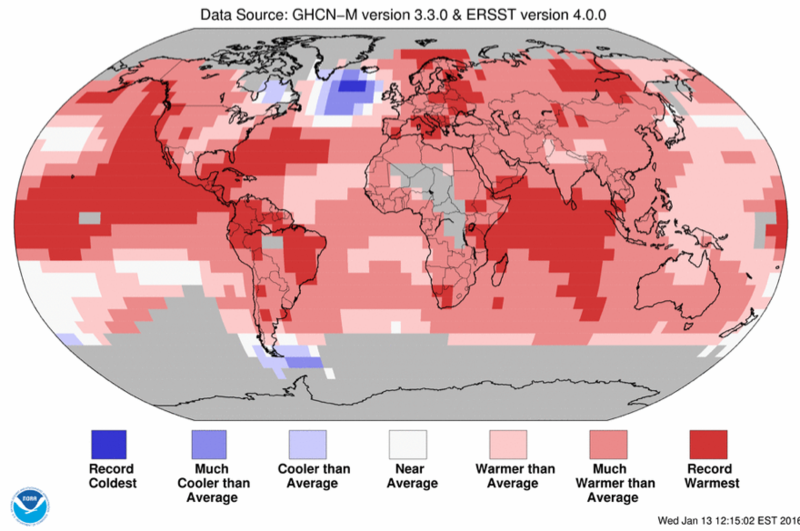 Lately, we are setting new global temperature records each year. 2015 was the hottest year on record based on land and ocean temperatures (Figure 1), and 2014 had the same notoriety until records were compiled for 2015. In coastal B.C., sea surface temperature at shore stations was warmer by 1.1 degrees Celsius in 2015 than the recent 30-year average (1980-2010). Figure 1. Land and ocean temperature percentiles for January to December 2015, compared to averages for the 20th century. Source: NOAA National Centers for Environmental Information. Judging by land and ocean temperature or by ocean temperature alone, 2016 is shaping up to set another record. Looking back 135 years, the 16 warmest years have all occurred since 1998, and that’s only 18 years ago. In the region closer to home (i.e., a 5 degree latitude by 5 degree longitude area that includes Howe Sound, Vancouver, Victoria, and Seattle), a study of recent temperatures compared to a 30-year average for 1981 to 2010 still highlights 2014 as well above average and 2015 as extreme, more than 1.4 degrees Celsius above the 30-year average. In coastal B.C., sea surface conditions measured at 12 shore stations (mostly at light stations, part of the Fisheries and Oceans Canada Shore Station Oceanographic program) and 12 Environment Canada weather buoys show that average daily sea surface temperature (SST) at all locations was warmer by about 0.8 degrees Celsius in 2015 compared to 2014. In particular, SST at shore stations was warmer by 1.1 degrees Celsius in 2015 than the 30-year average (1980-2010) and buoy locations were warmer by 1.2 degrees Celsius in 2015 than a 22-year average for 1989-2010. None of these stations is in Howe Sound; the closest being a buoy at Halibut Bank in the Strait of Georgia. Ocean temperature, salinity, and chemical properties like pH, a measure of acidity, tell us about the climate of the ocean. Species have long adapted to ocean climates that are typical for the region where they live. Changes to ocean climate that are outside of the historical range of variability can affect species and predator-prey relationships in various ways. Species ranges may migrate with temperature changes, generally moving north to stay within a preferred thermal zone, or species may suffer or adapt to warmer temperatures. Range shifts and adaptation will vary among species and other factors such as coastal development, management patterns, or even population specific adaptation may play a role. Annual land and ocean temperature anomalies (deviation of average annual temperature compared to the 1981-2010 average) for a 5 degree by 5 degree area that includes Howe Sound, Vancouver, Victoria, and Seattle. Source: NOAA National Centers for Environmental Information. Warmer ocean temperatures have a direct effect on sea level because as water warms the volume increases. This means sea level is rising in relation to temperature, no matter how much sea ice is melting and adding volume. Increases in sea level will amplify the risk of coastal flooding (see Squamish Flood Planning article). The timing of biological events can be altered by warming and other effects of climate change like changing freshwater flow patterns and the risk is that critical biological interactions become out of synch. A prime example here is the timing of salmon spawning runs. If, for example, juvenile salmon migrated to saltwater at a time when the plankton they feed on was unavailable, they would need to adapt to another food source or suffer. At the same time, changes in temperature and salinity patterns will affect ocean currents and, in turn, upwelling processes and cycles of productivity may be altered. Although some study is occurring, projections of changes to circulation patterns and upwelling are not conclusive. Global climate records set in 2015 include the warmest year, the largest increase in carbon dioxide, and the highest sea surface temperatures. 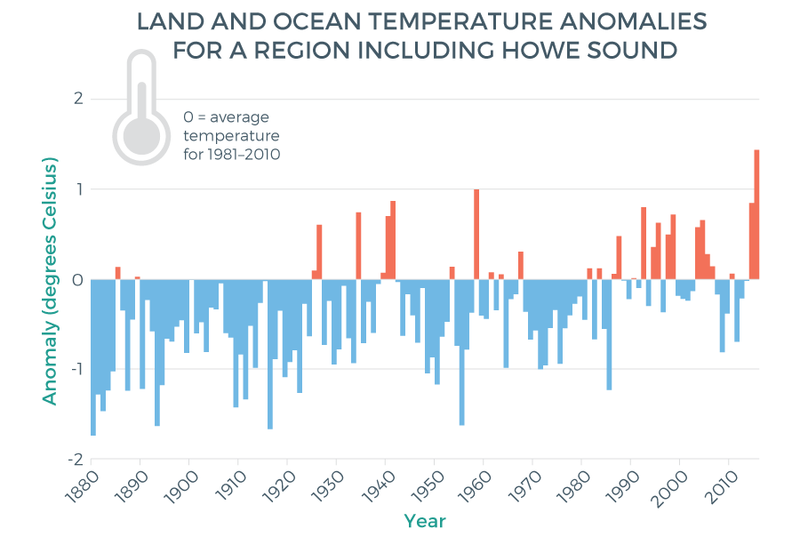 Sea surface temperature in 2015 was the warmest on record globally and in the Strait of Georgia, but we have no direct observations for Howe Sound. Some of the projected effects of a warmer ocean are being witnessed locally, regionally, and in the Northeast Pacific. The context of Howe Sound’s location is important to consider. The oceanography of the Strait of Georgia, the hydrodynamic connections to the Pacific, and the proximity of the Fraser River and the city of Vancouver will all play a role in local changes observed in Howe Sound. In Howe Sound, for example, northern anchovy, a species known to be highly responsive to shifts in ocean condition, were observed in both 2015 and 2016. While anchovies have been fished on the West Coast of Vancouver Island and infrequently in the Strait of Georgia, they are much more commonly found along the coast of California in warmer waters. Finally, changes in productivity patterns due to reduced upwelling with warming waters are expected. Evidence of this was seen well offshore in 2015 in the northeast Pacific in the form of nutrient (nitrate) depletion and lower than usual chlorophyll concentrations. (I.e., Nitrate is normally upwelled from deeper waters to feed chlorophyll, but a warmer surface layer prevented this from occurring in summer 2015.) Nutrient levels are also monitored in the Salish Sea by Fisheries and Oceans to continue to develop an understanding about nutrient supply conditions, changes in the Salish Sea and possible impacts on Howe Sound. These reported unusual events and conditions in the region and beyond are linked to a warming ocean. We cannot report local events and conditions due to lack of data locally in Howe Sound. Help prevent climate change by producing fewer greenhouse gasses. Adopt policies and practices within your organization. Eat sustainable seafood to foster healthy and resilient fish populations. Incorporate latest climate change hazard assessments into emergency response planning. Protect any cold water “refugia” within rivers. Strengthen regulations that protect riparian areas along streams to keep warming to a minimum. Implement the Wild Salmon Policy as it recognizes that diversity among salmon populations will be critical in helping salmon populations adapt to future climate conditions.